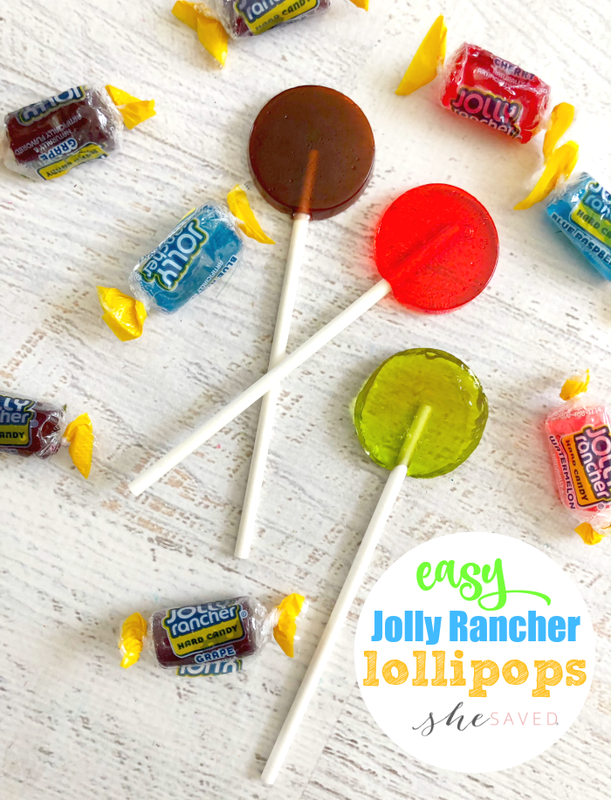 These Easy Jolly Rancher lollipops have long been one of our favorite treats to make and they truly are so simple! 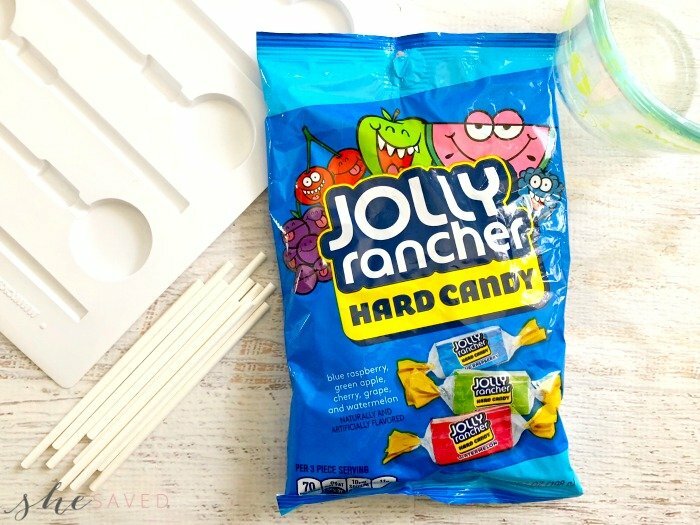 You might remember me sharing them a few years ago when we made them as 4th of July Jolly Rancher Lollipops without molds, but my daughter recently started making them in these fun molds and they are so fun, and a great way to use up any left over Halloween candy and/or make fun treats for the holiday season! 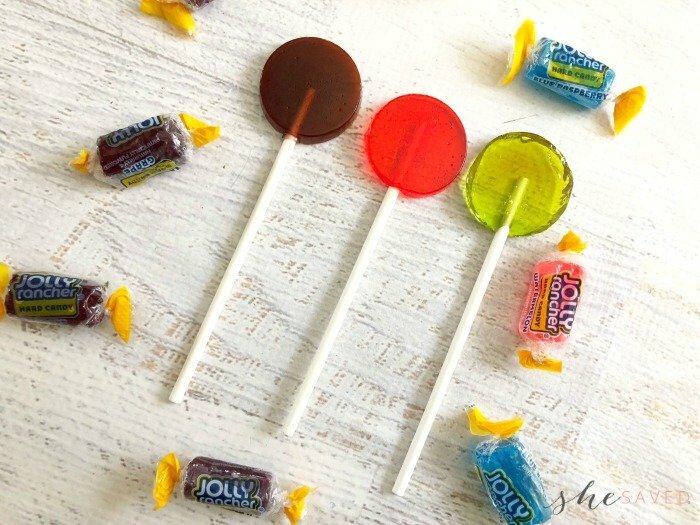 Make them with any type of mold you like, here’s how to make Jolly Rancher Lollipops. 1. 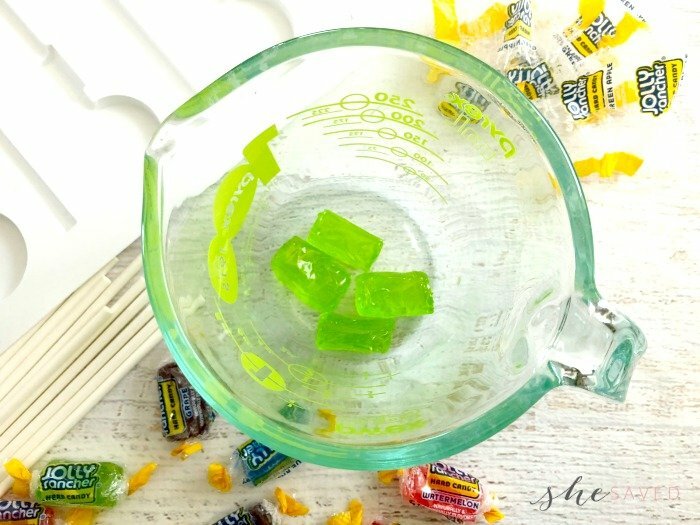 Unwrap 4 jolly rancher candies and place them in a coffee mug. 2. Lightly spray a non stick cooking spray in the sucker part of the mold and wipe out with a paper towel. 3. Microwave for 30 seconds on 60% power and then microwave for another 15-30 seconds on 80% power (your mixture should be bubbling, caution it’s very hot). 4. Carefully and quickly pour your melted Jolly Rancher into your sucker mold. 5. Rinse your mug with hot water until the leftover candies have melted off (this takes a minute or so). 6. Switch colors of Jolly Ranchers and repeat steps. 7. Place in freezer for 15 minutes and your suckers will pop right out. We used really simple molds for this demonstration but there are so many different sucker and candy molds that you can use. 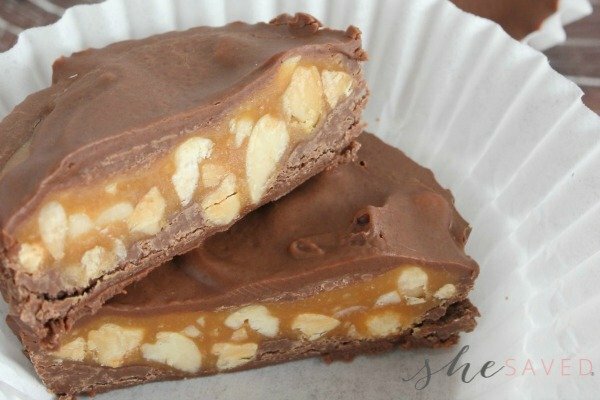 My daughter even makes them without the sucker sticks to make different shaped candies. 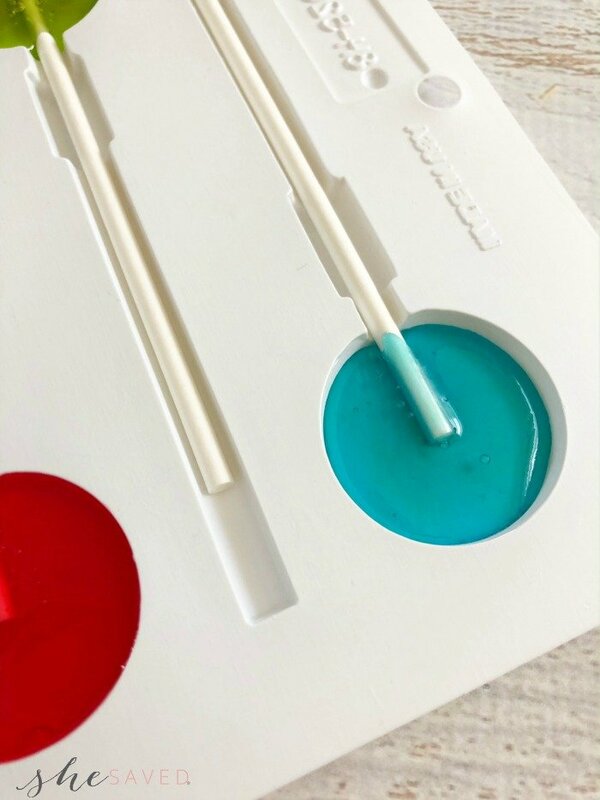 So many fun things you can do by melting Jolly Ranchers and depending on the occasion you can use different colors to go along with your theme or holiday! 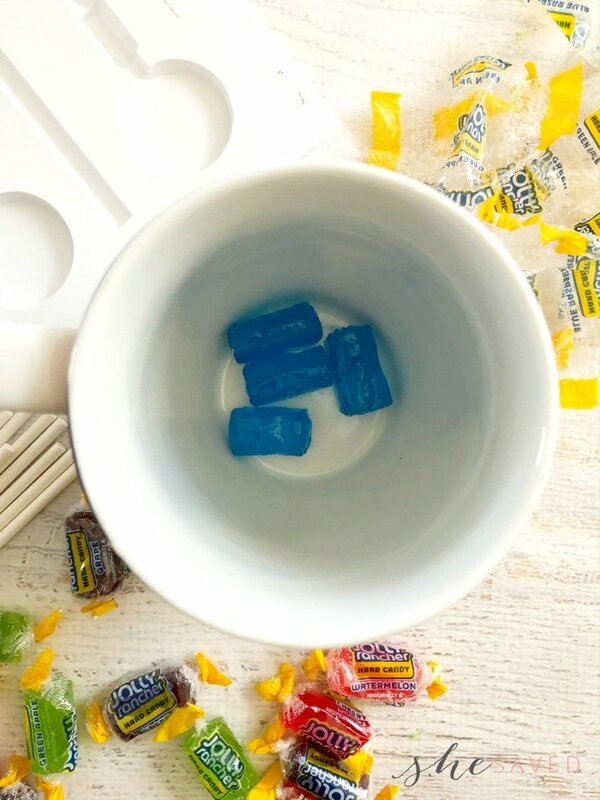 Unwrap 4 jolly rancher candies and place them in a coffee mug. Lightly spray a non stick cooking spray in the sucker part of the mold and wipe out with a paper towel. Microwave for 30 seconds on 60% power and then microwave for another 15-30 seconds on 80% power (your mixture should be bubbling, caution it’s very hot). Carefully and quickly pour your melted Jolly Rancher into your sucker mold. Rinse your mug with hot water until the leftover candies have melted off (this takes a minute or so). Switch colors of Jolly Ranchers and repeat steps. Place in freezer for 15 minutes and your suckers will pop right out. « HALLMARK CHANNEL’S Christmas in Love + Giveaway!